ESSEX — The Carolyn R. Greenleaf Memorial Music Award Committee announced Richard Pittsinger as the Spring 2015 recipient. Pittsinger is a 10th grader at Valley Regional High School where he sings with the chorus, concert choir, and Madrigals, as well as the ensembles Natural Minors and Mad Men. In addition, he will be seen as one of the leads in the Valley Musical Production of “Band Geeks” that runs through 15. 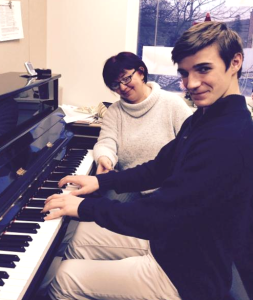 A former student at the St. Thomas Choir School in New York City, Pittsinger has been accepted into the Juilliard Pre-College Program, which he will begin his senior year. He will study piano at the Community Music School with Oxana Lauria. The Carolyn Greenleaf Memorial Committee accepts applications twice a year. This merit-based award is open to students of Middlesex County and the Lymes and is awarded by the Community Foundation of Middlesex County/Carolyn R. Greenleaf Fund.